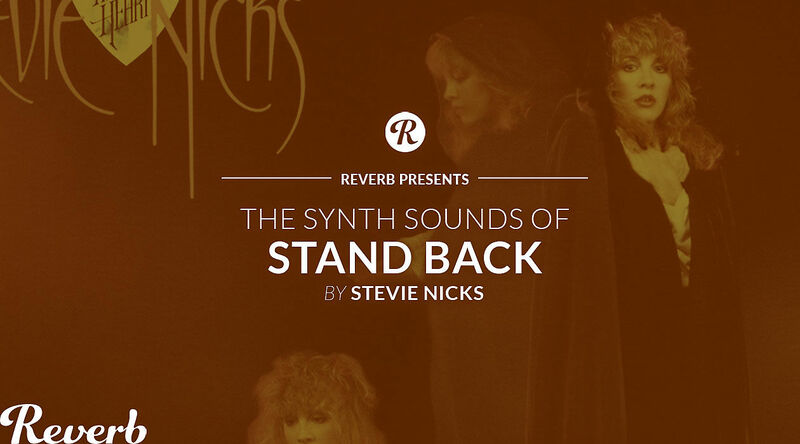 The Synth Sounds of Stevie Nicks' "Stand Back"
In our previous season of The Synth Sounds Of…, William Kurk broke down the myriad synth parts of Prince's "1999," the self-titled track of his fifth studio album that would bring him wider fame and set the stage for Purple Rain. Though the Purple One was just beginning to loom large over the pop landscape, Stevie Nicks was quick to pick up on his presence. While driving and listening to 1999's second single, "Little Red Corvette," she started crafting her own song. Soon, Prince himself got involved, playing keyboards on the sessions. "Stand Back," the lead single to Nicks' second solo album, The Wild Heart, was the result. William starts with the arpeggiated bassline, originally played on a Jupiter-8, but he uses a Juno-106. Putting a saw wave through the arpeggiator will give the appropriate rhythm, but to get away from the "short and stubby" hits, you'll have to pull up the envelope's Decay to lengthen each note and turn the sub-oscillator on to add some heft. Prince used the Oberheim OB-X to craft the chords of "Stand Back," but William has found the same sounds on the Dave Smith Instruments Prophet-6. The stacked saw waves give the "body and muscle to the sound," in addition to a certain alley cat "meow" quality, according to our esteemed host. The Oberheim DX, another favorite machine of Prince's, is used to create the heart of the drum pattern. "If you notice from time to time, the hi-hat will double up, and that's not me actually playing a double," William says. The finicky machine sometimes has a mind of its own. "It's the beginning of Skynet." Before the AI takes over, you can play around with the audio files in our Logic, Ableton Live, and Pro Tools sessions below, and download our free, exclusive presets for the DiscoDSP OB-Xd, Arturia Jup-8 V, and Roland Cloud Jupiter-8, which you can try out as part of a free trial with the Roland Cloud Instrument Suite. Arturia Sale: Now through September 20, U.S. customers can get a Reverb Exclusive discount on the Arturia software synths used in our videos. Use promo code REVERBSOUNDS2 at checkout for 33% off the Arturia Jup-8 V and 20% off the Arturia V Collection 6. Synth Sounds Moog Model D Giveaway: Also through September 20, we're offering you the chance to win the tools to create your own signature sound with the Reverb The Synth Sounds Of Giveaway. Click here to learn how you can win a Moog Model D; an Arturia KeyLab 49 MIDI Controller with Ableton Live 10 Standard, Arturia V Collection 6, Reverb Digital Exclusive Content Bundle; or $100 in Reverb LP bucks.